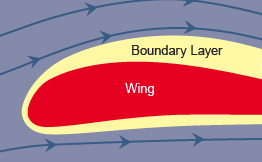 Aerodynamics is the study of forces and the resulting motion of objects through the air. Studying the motion of air around an object allows us to measure the forces of lift, which allows an aircraft to overcome gravity, and drag, which is the resistance an aircraft “feels” as it moves through the air. 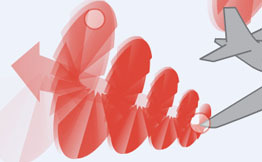 Everything moving through the air (including airplanes, rockets, and birds) is affected by aerodynamics. 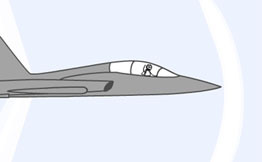 In this section, we will explore how lift and drag work at both subsonic speeds—slower than the speed of sound—and, later, at supersonic speeds—faster than the speed of sound. 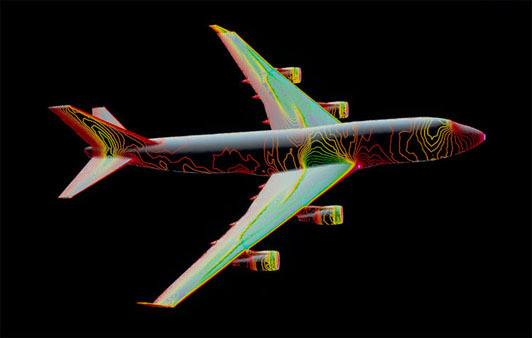 A sophisticated computer program produced this “map” of the air pressure changes on a Boeing 747 jetliner traveling at 84 percent of the speed of sound. 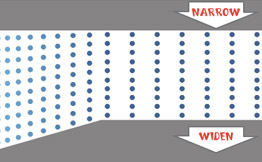 The lines link points of equal pressure. Red shows higher pressure; green shows lower pressure.